William Butler Yeats (/ˈjeɪts/; 13 Juin 1865 – 28 Januar 1939) wis an Erse poet an ane o the foremaist figurs o 20t-century leeteratur. A pillar o baith the Erse an Breetish leeterary establishments, in his later years he served as an Erse Senator for twa terms. Yeats wis a drivin force behind the Erse Literary Revival an, alang wi Lady Gregory, Edward Martyn, an ithers, foondit the Abbey Theatre, whaur he served as its chief during its early years. In 1923, he wis awairdit the Nobel Prize in Leeteratur as the first Erseman so honoured for whit the Nobel Committee describit as "inspired poetry, which in a heichly airteestic form gies expression tae the spirit o a whole naition". 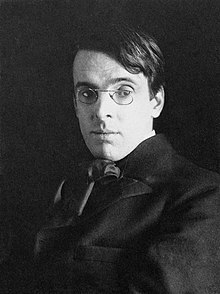 Yeats is conseedert tae be ane o the few writers wha completit thair greatest wirks efter bein awairdit the Nobel Prize; such wirks include The Tower (1928) an The Winding Stair and Other Poems (1933). ↑ The Nobel Prize in Literature 1923. Nobelprize.org. Retrieved on 3 Juin 2007. This page wis last eeditit on 1 Mairch 2019, at 08:18.